For the past decade or so, I have spent the first Saturday of December in the kitchen of my church. Together with some of my cousins and many, many volunteers, we prep and serve hundreds of lunches at our annual Christmas bazaar. It’s the kick-off to my holiday season and it’s time that I truly enjoy. For many of those years, my husband has participated on the same day in a paddle tournament with our very good friend, Marty who I jokingly refer to as his paddle wife! They have a lot of fun together and so it’s a win-win in my book. After the paddle tournament, there is always a casual dinner at someone’s home and that’s where I get to participate by bringing an appetizer or dessert. This year I brought Chocolate Crinkle Cookies that were easy and delish. On the evening of this year’s party, I was chatting with a few friends when all of a sudden someone placed an appetizer in front of us that had not yet made it’s way into the room where we were sitting. We dug in. What was this red platter of deliciousness we all thought? It was sweet and spicy and served on top of cream cheese with some hearty crackers. Immediately addictive, the appetizer’s ingredients and its source needed to be revealed! Allie B., also a “wife of paddle participant” was the chef behind the appetizer and we struck up a delightful conversation together later that evening. Although I snuffed out the ingredients, I failed to ask her for the actual recipe. I figured it was the least my husband could do to email her husband to ask for it, right? Turns out, he wasn’t the only one who did because like I said, the stuff is going to be your new best friend. 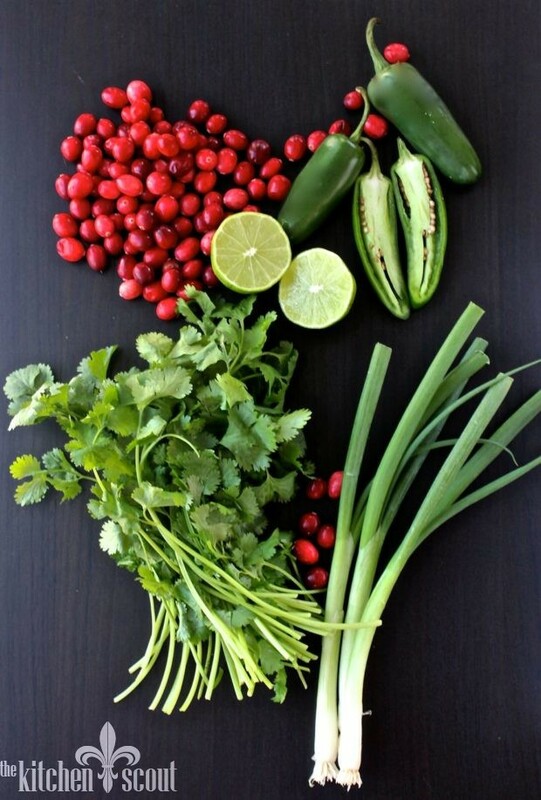 Fresh cranberries are mixed with sugar, green onions, jalapenos, cilantro, citrus, cumin and salt. The mixture sits in the fridge for about 4 hours so the sugar can help to break down the cranberries and the flavors can marry. Turns out, the inspiration recipe has quite a bit of sugar in it (no wonder we all loved it!). I did a little checking around some other sites that had modified the recipe and learned I could really cut back the sugar without sacrificing the flavor. I have made the dish 3 times to take to gatherings and each time I have tweaked the recipe a bit further, amping up some of the other ingredients to balance things out. This past week, I accidentally took a photo of the ingredients with a LIME rather than a LEMON and so that’s how I tweaked it a bit further! I prefer the lime to the lemon as it turns out. Right after the photos were shot, my friend who was helping me with another project took a bite and insisted she needed the recipe straight away for a party later in the week. She couldn’t wait for Friday’s post! She actually made the salsa without a food processor so it can be done by hand if need be. The next few photos were taken with my IPhone after my camera decided to break. Can you believe it? Thankfully, I found a local company that can fix it. You are going to love this one. Promise! Please let me know if you make the Cranberry Jalapeno Salsa. And thank you to Allie B. for introducing me to this delicious new appetizer. One Year Ago: It’s a Wrap 2015! 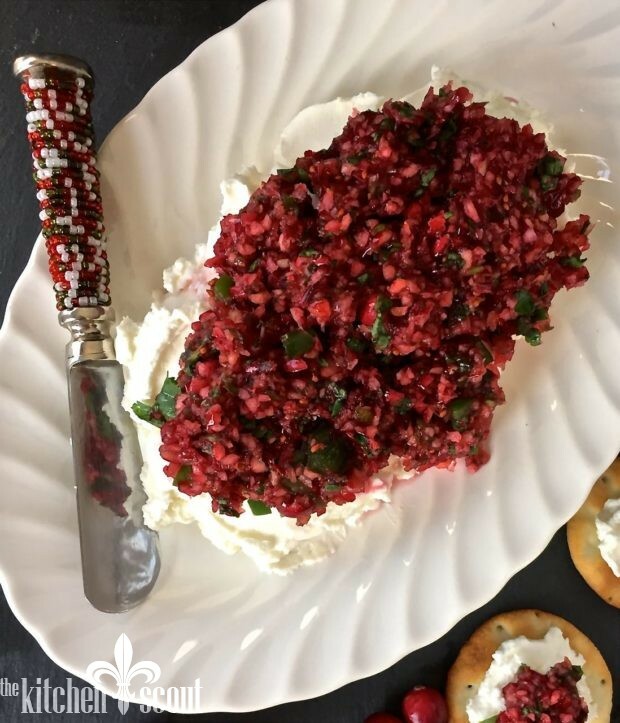 This festive and addictive salsa appetizer is terrific for your Christmas celebrations given its red and green colors! 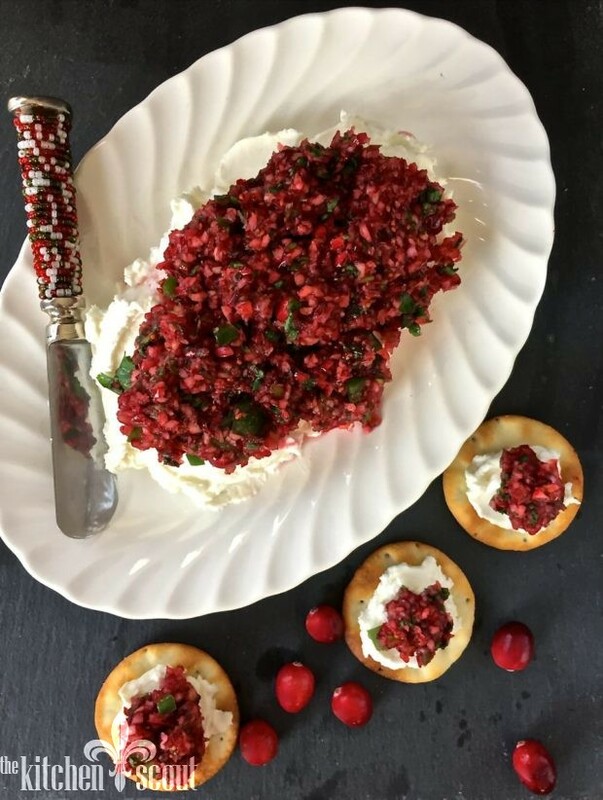 Purchase some extra bags of cranberries while they are still around and store them in the freezer so you can whip up this tasty dip for the Super bowl or at Valentine's day or another time of year! Serve with a hearty cracker such as the pita crackers shown. Recipe is adapted from Mel's Kitchen who adapted it from Jamie Cooks it Up! The salsa can be served over 16 ounces of goat cheese (my preference) or 2, 8 ounce packages of softened cream cheese as the original recipe suggests. See my notes. In a food processor, pulse the cranberries with the sugar until coarsely chopped. You can also chop the cranberries by hand and mix with the sugar. Add the green onions, cilantro, jalapeno peppers, lime juice, cumin and kosher salt and pulse until combined – you don’t want it to be a puree, but still have some texture to it. Refrigerate mixture for about 4 hours so the flavors have time to develop and the cranberries break down a bit. Taste and adjust for seasoning. When ready to serve, spread the cheese thickly in an even layer on a serving plate. 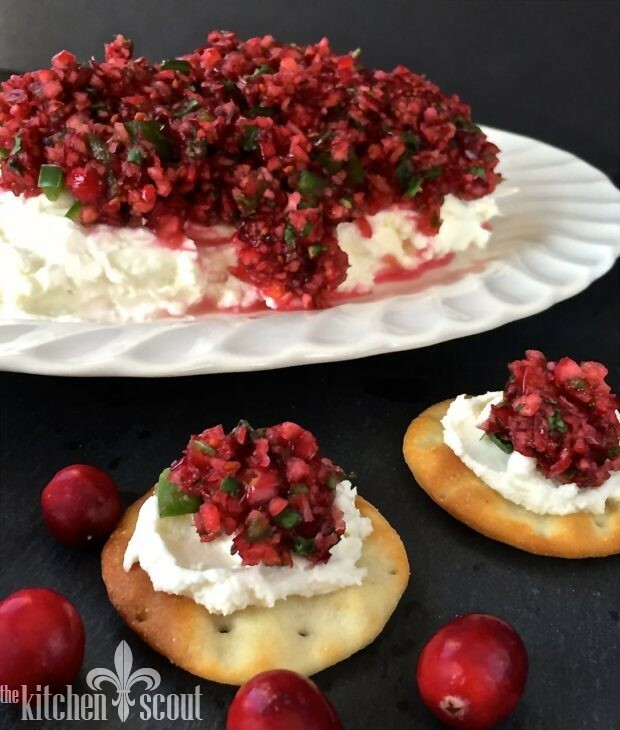 Use a slotted spoon to place the cranberry salsa over the cheese (There will be a lot of liquid that seeps out as the salsa sits and it’s best to leave that behind for a nicer presentation. You can drizzle a little of it over the salsa once it is plated). The original recipe calls for the salsa to be served over softened cream cheese, but the flavors really stand up well to goat cheese in my opinion! I like to whip the goat cheese with a little cream cheese and some half and half to give it a fluffy texture. For a really pretty presentation, you can prepare the individual crackers yourself so friends can grab and go! You’re right. This is so addictive and so delicious! Thank you Valerie!! Merry Christmas to you and your family! Gorgeous! The photos are spectacular. Can’t wait to try it. Merry. Happy. Thanks for all of your direction in 2016!